Answering paragraph III of the plaintiffs' complaint, defendant admits that in the past the said Laurel was an outstanding and successful comedian. Defendant denies that the said plaintiff was the creator of Laurel and Hardy and in this connection alleges that, in truth and in fact, said two players were placed together in acting by defendant studio. Defendant denies that said two players constitute a team and allege the fact to be that the contracts between the defendant Studio and said Laurel and Hardy are, and have been separate and apart, and no provision is made therein for the combination of the two, and that under the contracts attached to plaintiffs' complaint, defendant has the right to produce photoplays, if desired, with Stan Laurel alone, and without connection with Hardy. In connection with the matters set forth in this paragraph of the answer, the defendant alleges, however, that the said plaintiff, Stan Laurel, has carried on a continuous course of conduct since October 8, 1937, all of which, as more particularly hereinafter alleged, has lessened the success both individually and in connection with Hardy or any other person. Defendant denies, generally and specifically, each and all of the allegations of paragraph V of the plaintiffs' complaint. Further in this connection, defendant alleges that the contract specifically provides that it comprises the entire agreement and that there are no matters of contemplation or agreement or implied covenants outside of the express provisions of the written contract. Answering paragraph VI of plaintiffs' complaint, defendant denies that at all time between the 8th day of October, 1937, and the 12th day of August, 1938, plaintiffs, or either or both of them, duly performed all of the terms and conditions imposed on them, and each of them, by said agreement. On the contrary, defendant alleges, as hereinafter more specifically set forth, that said plaintiffs, and each and both of them, continuously, commencing with the 8th day of October, 1937, breached and defaulted the terms of the employment agreement between them, copies of which are attached to plaintiffs' complaint and marked "Exhibits A, B and C". Defendant admits that on the 12th day of August, 1938, it notified plaintiffs that it had terminated and ended the employment of plaintiff, Laurel, and that said defendant was no longer bound by said agreements, copies of which are attached to plaintiffs' complaint. Defendant denies that defendant thereby repudiated the contract and denies that plaintiffs, and each of them, have elected to treat said repudiation as a breach of said agreement by defendant. In this connection, defendant alleges that said plaintiffs, and each and both of them, breached and defaulted under the terms of the agreement, and that the said plaintiffs, and each and both of them, themselves repudiated said agreement, and that the said defendant, by reason of such default, breaches and repudiation, was entitled to and has the right to and did terminate and end said agreements and said employment. That defendant denies that on said 12th day of August, 1938, there had accrued as unpaid compensation under said agreement, for the services of said LAUREL, to plaintiffs from defendant, the sum of, Twenty Thousand ($20,000.00) Dollars, or any sum whatsoever. Defendant admits that it has refused to pay said alleged sum of, to-wit: Twenty Thousand ($20,000.00) Dollars, or any part thereof, and again alleges that by reason of the facts herein set forth, no sum was due or owing. Defendant denies that the remaining compensation for the services of the plaintiff LAUREL to defendant under said contract, performance of which was prevented by said repudiation thereof by defendant, amounts to the sum of, to-wit: One Hundred Eight Thousand ($180,000.00) Dollars, or any sum whatsoever, and defendant alleges that the plaintiffs herein, by reason of the facts above set forth, are entitled to no sum whatsoever. Defendant denies that there is any sum of any kind or character, or of any amount, due from defendant to the plaintiffs, or either or both of them, and defendant alleges that no amount of any kind or character from defendant to the plaintiffs, or either or both of them, is due or payable. Defendant denies, generally and specifically, each and all of the allegations of paragraph IX of plaintiffs' complaint. Defendant denies, generally and specifically, each and all of the allegations of paragraph X of plaintiffs' complaint. Defendant alleges that by reason of the default and breach of agreement on the par of the plaintiffs, and each and both of them, that on the 12th day of August, 1938, defendant had the right to and did terminate all contracts of employment between the plaintiffs and the defendant, and that on said date the said defendant gave notice, in writing of such termination to the plaintiffs, and to each and both of them. As to paragraphs I, II, III, IV, V, VIII, IX, and X of the First Cause of Action, which are re-alleged by reference in paragraph I of the Second Cause of Action, the defendant herein makes thereto the same answer which it did in the Answer to the First Cause of Action, and incorporates such Answer herein with the same effect as though set forth herein verbatim. Answering paragraph II of plaintiffs' Second Cause of Action, defendant denies that in accordance wit the terms and conditions of said contract between the dates set forth in paragraph II thereof, or at all, the plaintiff LAUREL duly performed services pursuant thereto in the production of said motion pictures, and each or either of them, and defendant alleges that during all of said times said LAUREL did not duly and properly perform his services and that said LAUREL breached the terms and conditions of the agreement, all as hereinafter more particularly set forth. 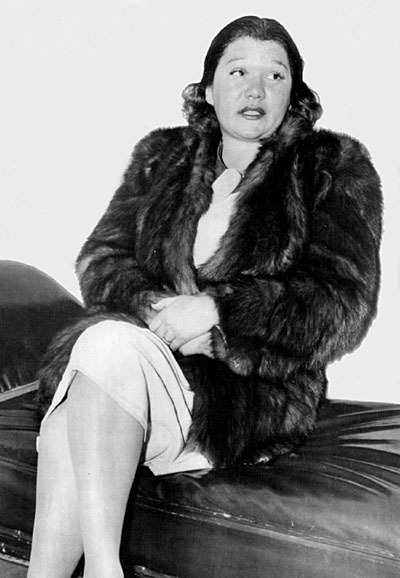 Dependant denies that on or about the 14th day of July, 1939, the shooting of the motion picture, "Blockheads", had been completed, or that the story for the next picture had been laid out by plaintiff LAUREL for defendant. In this connection, defendant alleges that the retakes and added scenes which were, and are, a very important part of said motion picture entitled "Blockheads" had not been completed on said 14th day of July, 1938. Defendant is informed and believes that prior to said July 14, 1938, the plaintiff LAUREL left the County of Los Angeles, State of California, but defendant denies that such leaving was with the knowledge or consent of the defendant, and specifically alleges that it was not with defendant's knowledge, and not with its consent. Defendant has no information or belief as to the places visited by the plaintiff LAUREL on such trip. Defendant admits that in making certain retakes and additional scenes for said motion picture, "Blockheads", that the defendant used the "stand in" of the plaintiff LAUREL, and alleges that this was unsatisfactory and improper, but was necessary for the reason that the said Laurel at the time was wrongfully and willfully absent from the State of California, and himself could not be so used. Defendant denies that defendant gave no notice to plaintiffs, or either of them, or any intention on its part to make any retakes or additional scenes for said motion picture, "Blockheads", or made as requests of plaintiffs, or either of them, that plaintiff LAUREL make himself available to render services to defendant for such purpose, or either of them, and defendant alleges that notice was given as to each and all of these matters, and that in addition thereto defendant alleges that no notice was necessary because the said plaintiff LAUREL, and likewise the plaintiff STAN LAUREL PRODUCTIONS, INC. well knew it is the general and universal custom of the motion picture business that retakes and added scenes are made of a picture after completion of the original shooting of the picture, and that it was necessary for him to be present not only for the acting therein, but also for the writing, direction and cutting thereof. Defendant denies that defendant waived or relieved plaintiffs, or each or either or any or both of them, from furnishing to defendant under said agreements the services of plaintiff LAUREL for such purposes, or for any other purpose during the said absence of the plaintiff LAUREL from said County of Los Angeles on said visit to said New York City, or any place else. defendant does not have sufficient information or belief to enable it to answer Paragraph II of the Second Cause of Action and, basing its denial upon such lack of information and belief, denies that said plaintiff LAUREL returned to the city of Los Angeles, County of Los Angles, State of California, from said trip to New York on or about the 30th day of June, 1938, and promptly, or at all, thereafter notified said defendant that he was ready, willing or able to render further services to said defendant pursuant to the terms of said contracts at any time or any place as in said contracts provided, or to carry out those instructions of the defendant in connection with the services to be rendered by him thereunder. In this connection, defendant alleges the fact to be that although the defendant was attempting to locate and talk to the plaintiff LAUREL, that nevertheless when the said Laurel returned to Los Angeles, he refused to talk with or communicate with the defendant herein, and wrongfully and willfully continued to remain away and went again from the City of Los Angeles to Catalina Island, California. Defendant admits that on or about the 12th day of August, 1938, it notified plaintiff that it had terminated and ended said agreements between defendant and plaintiffs and that it would no longer be bound thereby. Defendant alleges that by reason of the actions of the said plaintiffs, and each and both of them, it had the right so to proceed. Defendant denies that by any action whatsoever of the said defendant it repudiated the agreement or that plaintiffs, or each of them, have elected to treat said repudiation by defendant as a breach of said agreements, and defendant alleges in this connection that it had the right to terminate and cancel the agreements between the said defendant and the plaintiffs, and both and each of them. That some time between July 5, 1938, and July 14, 1938, the plaintiff LAUREL not only wrongfully and wilfully neglected his duties to the defendant, but further, he wrongfully and wilfully and without the consent or knowledge of the said defendant, left the State of California and remained away from the said Studio and did not return thereto. That at the time the said plaintiff Laurel so wrongfully and wilfully removed from the State of California and remained absent from the Studio, he knew that it was his duty under the contracts to be working upon the story for the next picture which was to be produced by the defendant, and in which he was to appear. He further had been notified and had fully knowledge of the urgent necessity for the immediate preparation and production of said next picture, and, therefore, the necessity for the preparation by him od the story, and for his work thereon and in the writing thereof. That said plaintiff LAUREL likewise, at all and said times, had full knowledge that the said picture, "Blockheads", was incomplete, and that the cutting, retakes, added scenes, previews and his acting therein, and writing and direction thereof, had not been completed, and that he was wrongfully and wilfully leaving the said State of California and his employment in the Studio without the completion of said matters, and said plaintiffs had full knowledge of the damage and injury that would be, and was, sustained by Studio by reason of said plaintiff LAUREL said defendant suffered great damage and injury and extra cost and expense in the completion of such picture, "Blockheads" and in that said pictur was inadequately and improperly completed and released because of the inability to properly complete the same due to the wrongful and wilfull absence of the said LAUREL. That said actions alleged in paragraph I of this First Affirmative Defense constituted a breach and default by the plaintiffs under the agreements alleged in plaintiffs' complaint between the plaintiffs and the defendant and constituted such a default and breach as to give to the said defendant herein the right to terminate such agreements and the employment of the plaintiff, and the said defendant under said right did so terminate said agreements and employment on August 12, 1938. That since the notice of termination was given by the said defendant to the said plaintiffs, the said plaintiffs have used no reasonable diligence or effort in procuring other employment for the said Stan Laurel. That the said Stan Laurel has continued since the notice of termination of August 12, 1938, to conduct himself in such a way as to prevent his obtaining any other employment and to bring himself into ridicule and contempt, and has in all respects failed to conduct himself with the regard, or any regard, to public convention or morals, and he has continued to commit many acts which have tended to, and do tend to, and do, degrade him in society and to bring him into, and which have brought him into, public hatred, contempt, scorn and ridicule, and he has continued to carry on a continues course of conduct that has tended to, and has, shocked, insulted, and offended the community, and ridiculed public morals and decency. That since the said August 12, 1938, the said Stan Laurel on numerous occasions has been intoxicated in public. That he has participated in such public disturbances in and near his home that it has brought the complaints of neighbors and police have been called. That he has been arrested. That he has carried on a continuous public quarrel and public reconciliations with his wife, Illeana, and they have had between them public scenes and disturbances, and that the said Stan Laurel has continued to have quarrels, contentions and disturbances with other persons and with his former wives and one woman who claims to have been a wife, and whom Stan Laurel claims was not a wife, and that as a result thereof there has been, and is now, continuing to be a great amount of adverse newspaper and other publicity throughout the United States and foreign countries, all of which is degrading Stan Laurel in society and bringing him in and keeping him in public hatred, contempt, scorn and ridicule, and which sets forth Laurel as shocking, insulting and offending the community and riddling public morals, decency and conventions. That all of the actions of the said Stan Laurel are prejudicing the motion picture industry in general, and prejudicing his value as an actor and performer in the motion picture industry. That if it were not for such continuing willful and wrongful conduct upon the part of the said Stan Laurel, the said Stan Laurel, with reasonable effort, could earn all of the amounts called for to be paid under said agreements, copies of which are attached to plaintiffs' complaint and made a part thereof, and which have not heretofore been paid by defendant to plaintiffs, and said plaintiff, Stan Laurel, could, under such circumstances, earn said amounts within the period provided for within said agreement, to-wit: the period between August 12, 1938, the date of the notice of termination, and October 8, 1939 (the end of the period of the contract as provided for therein). That the said Stan Laurel, with reasonable effort and diligence, could, and can, earn, between August 12, 1938, and October 8, 1939, all amounts called for to be paid under said agreements, copies of which are attached to plaintiffs' complaint and made a part thereof, and which have not heretofore been paid by defendant to plaintiffs. "The services of the ARTIST until the full completion of the last of said photo plays contemplated herein shall be rendered as to the making of motion pictures wholly and exclusively, to and on behalf of the STUDIOS (with the exception of one outside picture, or herein provided for), and shall be rendered to the best ability of said ARTIST and to the fullest extent possible, to the end that the photo plays to be produced hereunder shall be of a nature and kind fully compatible with the excellent product heretofore made by the ARTIST, and be of the same high standing. Said ARTIST will, diligently and zealously perform the services contemplated hereunder, and will do everything possible within his power that the production of each photoplay will be had expeditiously and in such a manner as to produce the same as economically and reasonably as possible." In this connection, defendant alleges that from the time of the commencement of the contract of October 8, 1937, until the termination of the contract on August 12, 1938, the plaintiff STAN LAUREL did not render his services wholly and exclusively to the making of motion pictures thereunder, and did not render his services to the best ability of said plaintiff, or to the fullest extent possible, to the end that the photo plays to be produced under said contract would be of a a nature and kind fully comparable with the excellent product theretofore made by the said Stan Laurel, or be of the same high standing, and said plaintiff STAN LAUREL did not well, diligently or zealously perform the services contemplated under said agreements and did not do everything possible within his power that the production of the two photo plays, to-wit: "SWISS MISS" and "BLOCKHEADS" be had expeditiously or in such a manner as to produce the same as economically or reasonably as possible. But that on the contrary, the plaintiff, Stan Laurel, on various and divers occasions arrived at the studio for work under the influence of liquor. That on many and divers occasions the said Stan Laurel drank intoxicating beverages during the course of a day while working. That on many and divers occasions the said plaintiff STAN LAUREL was late for work, and left work early. That during the course of a day's work on many occasions the said Stan Laurel would delay in appearing for scenes, or in assisting in directing the same. Said Stan Laurel would not cooperate with the director on "SWISS MISS", and would not work with nor cooperate with the other employees of the Studio in connection with the making of the picture. On many and divers occasions the said Stan Laurel, without right, absented himself from the Studio. The said Stan Laurel, from time to time, made depreciating and ridiculing and belittling remarks about the Studio and the officers thereof, all of which was calculated to and did affect the morale of the employees of the Studio. That the said plaintiff STAN LAUREL wrongfully and without the knowledge or consent of the defendant, on or about a date between July 5, 1938, and July 14, 1938, absented himself from the Studio and left the State of California and did not thereafter at any time return to said Studio or appear at said Studio ready for work. That said actions alleged in this Third Affirmative Defense constituted a breach and default by the plaintiffs under the agreements alleged in plaintiffs' complaint between the plaintiffs and the defendant, and constituted such a default and breach as to give to the said defendants herein the right to terminate such agreements and the employment of the plaintiff, and the said defendant did so terminate said agreements and employment on August 12, 1938. "THIRTEENTH: CONDUCT OF ARTIST: ARTIST agrees to conduct himself with due regard to public conventions and morals and agrees that he will not do or commit any act or thing that will tend to degrade him in society, or bring him into public hatred, contempt, scorn, or ridicule or that will tend to shock, insult or offend the community or ridicule public morals or decency or prejudice the producer or the motion picture industry in general." That from the very commencement of the term, to-wit, October 8, 1939, of the contracts, copies of which are attached to plaintiffs' complaint, said Stan Laurel, contrary to the provisions of said agreement above set forth, has failed to conduct himself with due or any regard to public conventions and morals, and he has done many and various acts and things which have tended to, and did, degrade him in society, and to bring him into public hatred, contempt, scorn and ridicule, and that have tended to, and did, shock, insult and offend the community and ridicule public morals, decency and conventions and that those acts and things have prejudiced, and greatly damaged, the producer defendant in this action, and the motion picture industry in general. That since said October 8, 1937, said Stan Laurel on numerous and divers occasions has been intoxicated in public; that he has had public quarrels and contentions; that there have been many public scenes; that the police have been called to his home and to investigate him. That he has carried on continuous public reconciliations and public quarrels, and marriages, and re-marriages, charges and counter-charges with his wife "Illeana" and they have had between them numerous public scenes and disturbances, and that the said Stan Laurel has continued to have quarrels, contentions and disturbances with his former wives and one woman who claims to have been a wife and whom Stan Laurel claims was not a wife. That he has from time to time publicly committed strange and unusual and peculiar acts of various kinds and character. That as a result thereof there was from October 1937, to August 11, 1938, almost continuously a great amount of adverse newspaper and other publicity throughout the United States and foreign countries, all of which was very degrading to Stan Laurel in society, and brought him into and kept him in a public hatred, contempt, scorn and ridicule, and which set forth the said Stan Laurel as ridiculing public morals, decency and conventions. That all of these actions of the said Stan Laurel greatly prejudiced the producer, the defendant, Hal Roach Studios, Inc., and was very prejudicial to the motion picture industry in general. That said actions set forth in this Fourth Affirmative Defense constituted a breach an default under the agreements alleged in plaintiffs' complaint, and constituted such a default and breach as to give to the said defendant herein the right to terminate such agreements and the employment of the plaintiff, and the said defendant under said right did terminate said agreements and employment. "FIFTEENTH: AGREEMENT FOR COOPERATION. For the purpose of stating clearly the intent of the parties hereto, it is hereby stated and declared that ARTIST COMPANY, ARTIST and STUDIO will cooperate to the fullest and utmost extent with each other to commence and complete the production of all of the photoplays herein as expeditiously as possible." In this connection, defendant alleges that the said plaintiffs did not, and each and both of them did not, from the time of the commencement of the contract on August 12, 1938, cooperate to the fullest or utmost extent, or at all, with each other or with the defendant, to commence or complete the production of all or either one of the photo plays made under said contracts, as expeditiously as possible, or in fast expeditiously at all. Defendant alleges that on the contrary, the said plaintiffs, and each and both of them, and particularly the said plaintiff STAN LAUREL, acting for himself and for the said plaintiff Stan Laurel Productions, Inc., willfully failed and refused to cooperate. That on many and divers occasions the plaintiff STAN LAUREL arrived at the studio for work in an intoxicated condition; that on many and divers occasions the defendant STAN LAUREL drank while working during the day; that on many and divers occasions Stan Laurel was late for work and left work early; that on many and divers occasions plaintiff Stan Laurel appeared in scenes under the influence of intoxicating liquors. That during the course of a day's work, on many and divers occasions, said Stan Laurel would delay in appearing for a scene or in assisting or directing the same. That said Stan Laurel would not and did not properly cooperate and assist in the cutting of "Swiss Miss". That on many and divers occasions the said Stan Laurel, without right, absented himself from the Studio. That said Stan Laurel from time to time made depreciating and belittling remarks about the Studio and the officers thereof, all of which was calculated to, and did, affect the morale of the employees of said Studios. Said Stan Laurel would not cooperate with the director on "Swiss Miss" and would not work with or cooperate with the other employees of the Studio in connection with the making of the picture. That the said Stan Laurel would not cooperate with the Studio in the hiring or employing of the actors and other employees that it desired to use in "Swiss Miss" and "Blockheads". That the said Stan Laurel would not and did not in any wise cooperate in the completion of said photoplay "Blockheads" and without the consent, and without the knowledge, of the said defendant Studio, this said Stan Laurel, before the completion of the picture "Blockheads" absented himself not only from the Studio, but from the State of California, and failed to return for the completion thereof. Said Stan Laurel has been in the motion picture business and an actor in the making of photo plays for many years, and well knows the great expense, damage and loss that can be and is sustained by a Studio in the holding up in the finishing of production by reason of the absence of one of the necessary performers or other employees. That the said Stan Laurel well knew that he was employed for the purpose of acting in, participating in the writing, and participating in the directing and in the cutting of all of the photo plays to be made under said contract, and of the photoplay "Blockheads", and knew that his absence during the making of said picture and before the final and entire completion thereof, would necessarily cause great inconvenience, loss and damage to the studio, defendants herein. That during the wrongful absence of said Stan Laurel, the said Studio did not know where he was or when he would return, if ever, or his plans, or what he intended to do, and it was necessary for the Studio to proceed without the said Stan Laurel in acting, writing, directing and cutting of said photoplay "Blockheads". Said Studio did so proceed to its great loss, damage and injury. Said Stan Laurel also had full knowledge that the said Studio had employed writers for the purpose of writing, under his direction, the script for the next photoplay, "Devil's Island", and that the said script was to be completed on or about August 1, 1938. That, notwithstanding said knowledge upon the part of the said plaintiff, said Stan Laurel wrongfully and willfully left the State of California and the Studio of the defendant, and without Laurel and his direction in said writing the said writers were unable to proceed with said script for "Devil's Island&", and all to the great loss and damage of the defendant. That said actions alleged in this fifth Affirmative Defense constitute a breach and default by the plaintiffs under the agreements alleged in plaintiff's complaint between the plaintiff and the defendant, and constitute such a default and breach as to give to the said defendant herein the right to terminate such agreements and the employment of the plaintiff, and the said defendant under said right did terminate said agreements and employment on August 12, 1938. That the acts and defaults of said plaintiff STAN LAUREL were, and are, in truth and in fact, the acts and defaults of the plaintiff STAN LAUREL PRODUCTIONS, INC., and that the knowledge of Stan Laurel of certain facts as herein alleged was in all respects the knowledge of the said Stan Laurel Productions, Inc. Defendant is informed and believes and, upon such information and belief, alleges that the plaintiff STAN LAUREL has been working and earning money since August 12, 1938, and that the true amount thereof is not know to defendant, and defendant prays that an accounting is made thereon. WHEREFORE, defendant prays that the plaintiffs take nothing and that it be adjudged that said arguments and employment referred to in plaintiffs' complaint be terminated, and that the said defendant has no liability or obligations thereunder, and that the said defendant have its costs of suit. before Hugh C. Huber, N.P. Comm. Ex. BEVERLY HILLS, CALIF.—Illeana Laurel, Russian dancer and wife of Stan Laurel, the movie comedian, is shown in county jail today after her arrest at a Russian café on a charge of being drunk on private property. Only a month ago Mrs. Laurel was placed on probation after a reckless driving conviction. 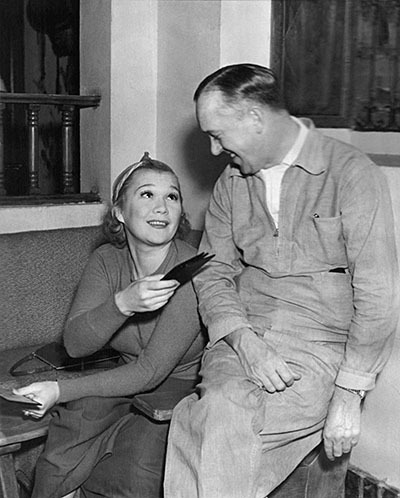 Stan Laurel with his wife Illeana, former Russian dancer, informally at the St. Catherine Hotel in Catalina. There has been a great deal of publicity, no doubt, over the entire United States, concerning the Stan Laurel difficulties since the termination of his agreement. Has your news clipping bureau been obtaining this? There should be some way we could get this.